"Shall I compare thee to a summers day?" ...Probably not, but I think you're nice! ... One of the goals I set for myself this year was to stay better connected with my friends. With Texting, Facebook, Twitter, Pinterest, Tumblr, Linkedin, blogging & Google+ you would think that would be easy, right? Well, if I just wanted to "like" a post or forward a tweet or ask for a reference than I believe there are certainly enough options at my disposal. It seems that all these awesome modes of staying "connected" have actually caused the opposite to occur in my life. I mean, what happened to the time when I would make a good old phone call to someone I cared about simply to "shoot the breeze"? Do I still have the ability to converse in dialogue for longer than a 150 word tweet? Have I now resorted to my only connection with friends being the creative Facebook birthday wish I give once every year to that "important person"? How could it be that I now feel LESS connected to some of my most important friends? improving my relationships. Some 30 Day Experiments focused on family (30 Day Experiment: Call a Family Member Every Day), some relate to my girlfriend (30 Day Experiment: No Technology on Dates), and others are designed to improve my connection with humanity (30 Day Experiment: Compliment a Complete Stranger). I have one for my dog and cat and I even have one centered on creating a better relationship with myself. 1) Personal Message - Either write a personal message via Facebook or send an email. Length was not nearly as important as the depth of the content shared. Turns out many were fairly lengthy. 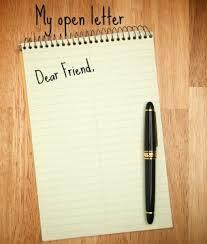 2) Express Gratitude - Somewhere in my message I must express my gratitude for what the friendship has meant to me. 3) Request Phone or In-Person Conversation - Each letter must conclude with an invitation to either talk via phone or if they live near enough, to talk in-person. You have probably heard the phrase that "when you give, you get." Well, I feel as though I got a lot as a result of giving a little. A simple note of appreciation to someone I care about has allowed me to reconnect with some and strengthen my relationships with others. What an awesome experiment. This is an example of an experiment becoming a continues habit. The entire purpose for these experiments is to try something out for a short period of time and determine if it has added value to my life. If the answer is yes, than I will most likely continue that practice. This experiment has done exactly that and I look forward to continuing these letters. Lesson: A good friend is like water to your soul.